Every wedding, civil ceremony or civil partnership are different. The Childcare Partnership can provide bespoke Wedding Childcare for your special day. Are you a bride or groom to be with children and would like them looked after on your special day? We can provide you with a wedding creche for your little guests and even look after your guest's children overnight. 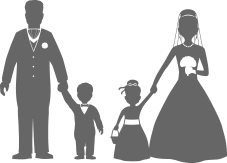 If you are invited to a no children wedding we can provide on site childcare at the venue for your or look after your children at home until you return. See what our existing clients have said about us. We used Wendy and The Childcare Partnership to look after almost 30 children at our wedding in November. They were completely professional, from our very first meeting prior to the wedding, until we said goodbye at 1.30 in the morning, after a very busy day. It was fantastic for us to be able to enjoy the day, knowing our children were close by, not only being looked after, but having a great time with activities and games. Many of our friends commented on how nice it was to be able to bring their children to a wedding, as nowadays many couples to be state no children, which is such a shame. The fact that we had two nannies in the evening to babysit our children and also our nephews for the night meant we could relax completely, spend time with out guests and make the most of our special day. We’re so glad we decided to use Wendy and her team - it cost less than we thought it might and was worth every penny. — Kelly and Rob Jones, Lincolnshire. We used The Childcare Partnership for our tipi wedding in June 2018. It was one of the best decisions we made! With a two year old ourselves and lots of little ones at the wedding, all the parents, including ourselves, found the nannies a god send. The nannies showed up fully equipped and made themselves at home, the kids flocked to them with no introductions needed.